Filpkart is the most popular online store in India. Filpkart recently launched it’s Digital Store “Flyte”, where you can purchase and download legal copies of MP3 music files. Going one step further, this time Filpkart introduced ebook section in it’s Flyte digital store. 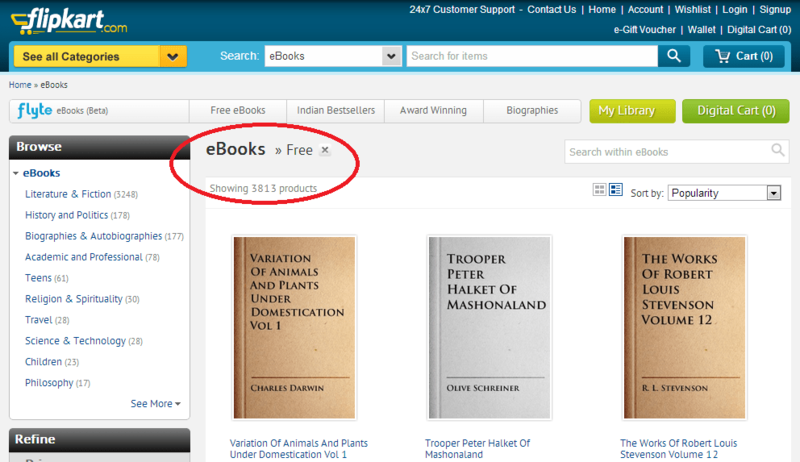 Interestingly, Flipkart is offering almost four thousand free ebooks! This means you can download and read legally free ebooks from Flipkart. New eBook Store of Flipkart. This store also offers Free eBooks. Filpkart runs it’s own online book store, but now they are also selling digital ebooks. You can download and read ebooks instantly. Some people think it is convenient to read eBooks. These type of books are affordable and easy to carry. This step of Flipkart will definitely encourage more Indian readers to go digital. You need Flipkart eBook application installed on your Android phone to read eBooks from this Flipkart store. I just installed Android eBook Application of Flipkart. It is absolutely free and you also get the chance to Preview bestselling eBooks. You can adjust brightness, font size. Night mode is available, so you get less stress on your eyes while reading eBooks. Nevigation, bookmarks, highlights, notes, search are some other features that make this eBook application better. How to Purchase eBooks from Flipkart? Add some balance in your Flipkart Wallet. Wallet is like a prepaid card. Now open eBook application of Flipkart on your mobile and log in to your Flipkart account. Go to the Flyte eBook store (Bag icon near Search) and purchase the book that you want with your Flipkart Wallet. You can also buy eBooks from Flipkart website. How to Read Free ebooks from Flipkart? Open Fipkart eBook application and go into Flyte Store. There is “Free Classics” section in this store. You can download and read free eBooks from this section. Alternatively, open Flipkart site on your computer. Go into Flyte eBooks from categories. Select Free eBooks section. Choose any free eBook that you want to read and Add to Library. It would be interesting to see, if in the future Flipkart launch it’s eBook Reader like Kindle by Amazon and offer witters in India to write, publish and sell eBooks from it’s store.